A forensic study of the blood-spatters on the Shroud of Turin adds to the large body of scientific evidence that the purported burial cloth of Jesus is a medieval artifact. 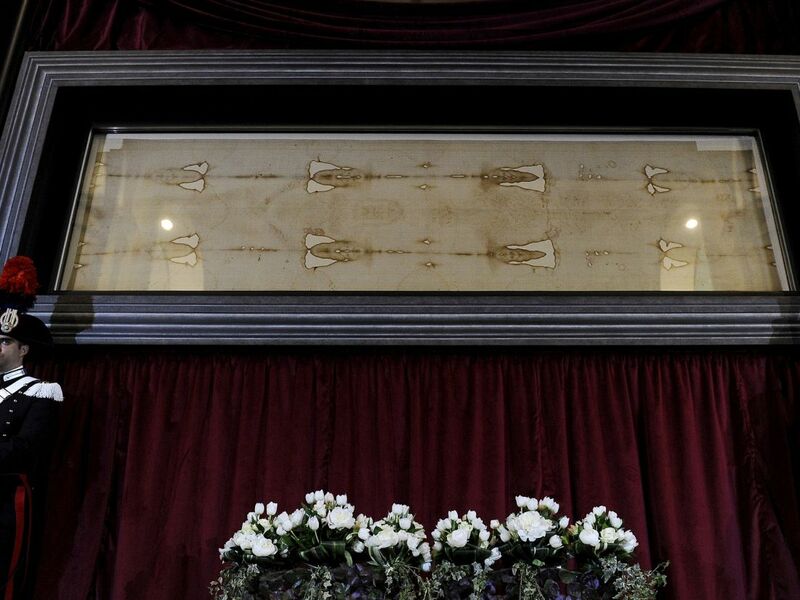 The analysis, published earlier this month in the Journal of Forensic Sciences, did not study the Shroud itself, which is kept under lock and key in the Cathedral of Turin and is only rarely shown to the public, the last time in 2015. Instead, in an experiment that looks straight out of a CSI episode, the scientists reproduced the supposed blood stains on the linen to see whether they could be compatible with bleeding that would have occurred due to injuries caused by crucifixion. The fragile linen cloth bears the faint image of a man displaying injuries and attributes that Christians associate with the crucified Jesus. Some faithful believe the impression was created by energy released at the moment of Christ’s miraculous resurrection. There are many stains on the Shroud that have been supposedly identified as blood. But the experiments focused mainly on the spatter on the back of the hands and forearms of the crucified man, as well as the dark spots linked to a wound on the right side of his chest where, according to the Gospels, Jesus was pierced with a lance by a Roman soldier as he was dying on the cross. Fortunately, the experiment did not involve actually nailing anyone to a piece of wood. “Crucifying my colleague wouldn’t have been very nice,” jokes lead scientist Matteo Borrini, a forensic anthropologist and lecturer at Liverpool John Moores University. 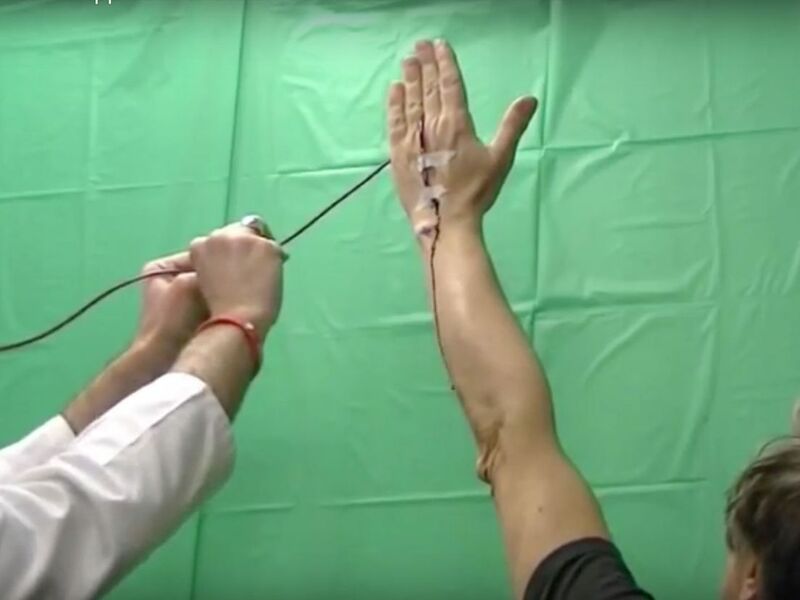 To reproduce the blood patterns on the hands and forearms, Borrini attached a transfusion tube to a volunteer’s wrist and pumped blood out of it, simulating a puncture wound that would have been caused by a nail going through the victim’s hand. Borrini’s team used both human blood and synthetic blood commonly employed in forensic tests. One key problem with simulating the effects of a crucifixion is that we don’t really know how Jesus - or any other victim of this brutal Roman execution method - was affixed to the cross. The earliest artistic depictions of Jesus’ death were made centuries after the fact, long after the Roman Empire had turned Christian and outlawed this punishment. Also, there are very few archaeological remains of crucifixion as a practice in general. In fact the only known solid piece of physical evidence is a 1st century C.E. heel-bone pierced by a nail, found in 1968 in a Jewish tomb in Jerusalem. The paucity of archaeological evidence of crucifixion is mainly because people sentenced to die on the cross, a fate reserved mainly for rebellious slaves and enemies of the Roman state, would hardly be given a proper burial afterwards. Also, the person could be tied to the cross with ropes, leaving no marks on bones for archaeologists to scrutinize. Even when nails were hammered into the unfortunate victim, they would have been reused time and again, since metal was a relatively rare and expensive commodity. Given our ignorance of the process, the forensic scientists repeated their blood-spattering experiments multiple times, placing the arms of the volunteer at different angles to the body and in various positions that may have been likely used in a real crucifixion. And here’s where the Shroud failed the test. When the arms were placed almost vertically, simulating a crucifixion in a Y position, the dripping blood formed rivulets on the forearms of the victim that were roughly similar to the patterns on the forearms of the image on the linen. But in that position, the spatter on the volunteer’s wrist did not match the stains visible on the left wrist of the man on the Shroud. To obtain that pattern, the victim would have had to be crucified with his arms roughly at a 45 degree angle to the body – which is similar to most classical depictions of Jesus’ crucifixion. In that position, however, the blood would not have reached the forearms, assuming that blood - even the Messiah’s - obeys the law of gravity. This means that if a person wrapped in the Shroud had truly been a victim of Rome’s cruelest form of capital punishment, he must have been somehow crucified in two different positions at different times. The scientists also repeated the experiment with the volunteer lying horizontally in the same position as the man in the Shroud, to test whether the stains might have been caused by post-mortem bleeding. But again, the patterns did not match, Borrini told Haaretz. Equally contradictory results emerged from the analysis of the chest wound, which was simulated by pouring blood on a mannequin in the same spot where the man in the Shroud sports a deep gash. When the mannequin was placed vertically, as if on the cross, the blood predictably flowed down to the abdomen, just as is seen also in the Shroud. But the liquid did not trickle to the back and form a pool in the kidney area, as appears on the image on the linen. Also when the mannequin was placed horizontally, again to simulate post-mortem bleeding, the liquid dribbled down to the area of the shoulder blades – much higher than on the Shroud. “The blood patterns contradict each other and form an unrealistic picture,” Borrini concludes. The most likely explanation is that the stains were painted by an artist who knew little or nothing about crucifixion and its effects, he concludes. Using forensic methods like BPA (Bloodstain Pattern Analysis) is becoming more and more common when trying to shed some light on issues like Jesus’ death as well as crucifixion in general, says Israel Hershkovitz, a physical anthropologist at Tel Aviv University who was not involved in Borrini’s experiment and has extensively studied the remains of the nail-pierced bone from Jerusalem. “It certainly offers a fresh perspective on the Shroud,” Hershkovitz told Haaretz. Despite the many unknowns on the actual process of crucifixion, he said the experiment was well-designed and quite convincing in supporting the idea that the revered cloth is the work of a human hand. Even now the findings are unlikely to settle the issue of the Shroud’s authenticity, which has long been fiercely debated. Although the Catholic Church encourages believers to worship the Shroud as a holy image of Christ, it has not authenticated the relic. And even what was arguably the most conclusive scientific analysis has failed to convince the Shroud’s most ardent supporters: carbon dating conducted in 1988 on some strands taken from the linen showed the cloth dated to the 13th or 14th century, which is also around the time when the Shroud is first mentioned in historical sources. Over the last decades, backers of the Shroud have questioned the results of the carbon dating, variably claiming the sample was contaminated or the experiment botched. Since then, researchers and more-or-less accredited experts from both camps have published reams of papers and studies attempting to support or debunk the relic’s authenticity. The often contradictory research has focused on everything from investigating the origin of the microscopic grains of pollen embedded in the Shroud to determining whether the stains on the linen can be positively identified as blood. It should be noted that Borrini’s experiment did not deal with the nature of the liquid that left the dark blood-like stains on the Shroud, but simply attempted to reconstruct the plausible blood flow from injuries caused by a crucifixion and compare that to the patterns on the linen. Highlighting the sensitivity of the issue, Borrini said that since news of his study first broke in Italian media, his social media accounts have been flooded with insults and threats.